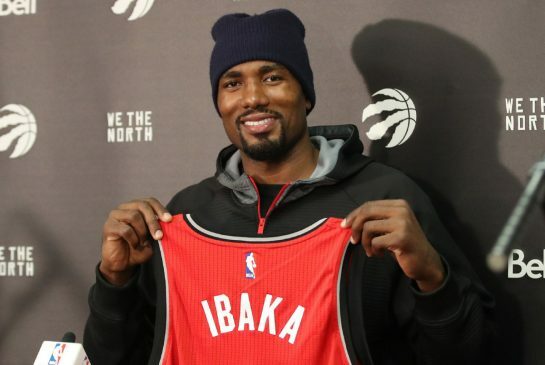 There’s no question the Toronto Raptors made a good move by acquiring Serge Ibaka from the Orlando Magic. The first-round pick they’ll give up probably won’t turn into anything, and Terrence Ross was made expendable by the emergence of Norman Powell. Ujiri on trying to re-sign Ibaka this summer: "I think it's extremely important. It's really important that we're able to do that"
Ibaka’s market is set in the sense he’ll command a max contract. And you have to believe the Raptors are prepared to foot that bill, otherwise they wouldn’t have traded for him. It’s nevertheless going to be expensive, especially when Kyle Lowry will be due a max deal as well. Patrick Patterson is also slated for free agency and feels like a goner. And even after he leaves, the Raptors will need to think about dealing a Cory Joseph, Jonas Valanciunas or DeMarre Carroll just to duck a $150 million payroll. And remember: Lucas Noguiera will be extension-eligible this summer, with restricted free agency on the horizon in 2018. Life is about to get really expensive for the Raptors, and while they’ll have to eat a lion’s share of these costs, there’s a good chance they look noticeably different by the start of next season.